On the bright side, I was able to give Jessie (dog) a bath today. Yup, Jessie's still hanging in there. Deaf as a doorknob, hobbles around when her arthritis is bad, but still a happy dog. It's been a very busy weekend. I saw J&L and baby C again yesterday, then went over to JJ's house to try to find some feral kittens whose mama had been hit by a car. Unfortunately we could not find them, despite looking in and under everything we could find. A couple times I thought I might have heard something, but I think it was just wishful thinking, as there wasn't anywhere around me where I didn't look! Sad, but at least we tried. This morning I was up at the crap of dawn to take a couple birds to auction (I did not put the GDW's in the auction, but I did meet their buyer there). Came home, zonked out for 2 more hours, FINALLY finished the drawings for the CCA gun, whew! I have to say that my knowledge of the Wright Flyer(s) has increased exponentially versus what it was a week ago. So, images ready, approved, hopefully I can transfer them tomorrow. It's going to be soooo hard with all the detail in the Flyer. I made a new tool today with a pin vise and an insanely-finely-sharpened sewing needle. I need the thinnest point I can get for this! You know much it hurts to poke yourself with a sewing needle? Well imagine looking at it at 10X magnification and decided it looks too dull. Weird, yeah. 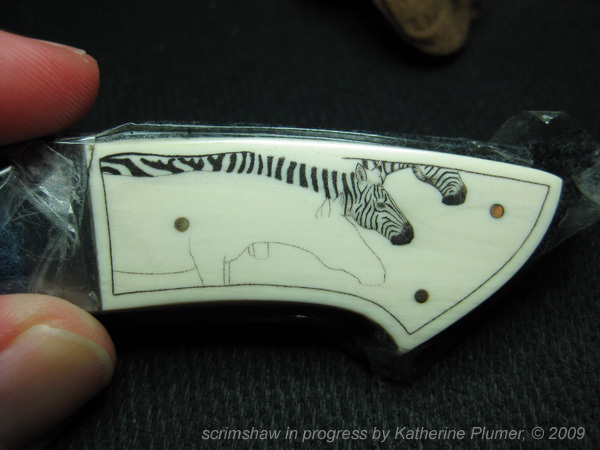 And then I worked on the zebra knife, which is coming along nicely.